Nicola Sturgeon has been urged to implement the lower limit after research showed safety benefits. 20's plenty: MSPs are looking at the proposals. Charities and public health organisations have written to First Minister Nicola Sturgeon calling on her to "seize the opportunity" to support the Safer Streets Bill, which is currently being scrutinised in the Scottish Parliament. The groups added Scotland needs to lead, as it did in banning smoking in public places and reducing the alcohol limit for drinking and driving, and the Bill offers "the best chance of safer, fairer roads". Adrian Davis, professor of transport and health at Edinburgh Napier University, said: "There is strong evidence that 20mph limits have had a positive impact on public health where they have been introduced. "There is consistent and convincing published research that shows 20mph speed limits reduce collisions, injuries, and motor traffic speed, all important public health concerns in Scotland." 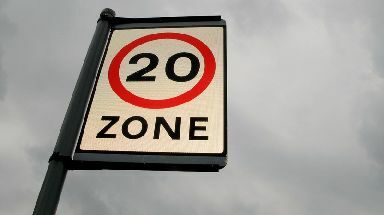 Professor Steve Turner, officer for Scotland at the Royal College for Paediatrics and Child Health, has previously outlined the organisation's support for 20mph limits. He said: "I urge local authorities in Scotland to introduce 20mph speed limits in built-up areas in order to create safe and healthier environments for children to walk, cycle and play in." A Transport Scotland spokesman said: "We share the view that 20mph speed limits are a good idea when implemented in the right environment. "However, we believe, and it is shared with many local authorities, that more evidence and further consideration needs to be given to the impact and consequences of a nationwide default 20mph limit, including an assessment of Scotland's road network before the measure proposed in the Bill can be fully supported."